Christian tradition associates one man, John (Ἰωάννης or יוחנן) with the author of our fourth gospel, one of the twelve apostles, the beloved disciple, the so-called letters of John, the brother of James, a son of Zebedee and Salome and the author of the book of Revelation. If true, this would be an unrivaled biography, this one man would be the author of five books in the New Testament and that would put him next to Paul in authorship. But the list goes on. In the New Testament, he is portrayed as part of Jesus’ inner circle, a “pillar” in the Jerusalem church, a witness to Jesus’ conversation with Moses and Elijah, the only one who didn’t forsake Jesus in the hour of his passion and the one to whom Jesus gave the responsibility for the care of his mother Mary. Are we talking about just one man, or perhaps others? There is a tradition that he was thrown into a cauldron of boiling oil but came forth unhurt, banished to the Isle of Patmos for a year and eventually died at Ephesus about the year 100. An alternative account of John’s death, which is credited to the early second-century bishop Papias of Hierapolis, claims that he was slain by the Jews. There is a Muslim tradition, involving the legend of Habib the Carpenter, which places John as one of the three disciples sent to Antioch to preach to the people there. Now what got me thinking about John, was a great fiction book I recently finished reading by Ian Caldwell. The Fifth Gospel. 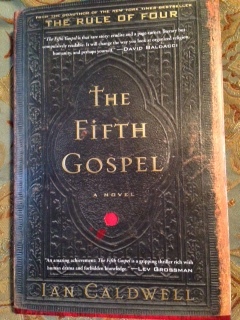 “The Fifth Gospel” is a murder mystery set in the Vatican. At the heart of the mystery is the Shroud of Turin and a fifth gospel (the Diatessaron) discovered by a researcher (Ugo Norgara) which he believed would prove the authenticity of the Shroud of Turin. Caldwell’s so-called fifth gospel is an original Diatessaron discovered by researcher Nogara who is murdered for unknown reasons. The plot reminded me somewhat of the DaVinci Code. Those familiar with early Christian history know that the Diatessaron was an attempt by a man named Tatian to condense the four gospels (Matthew, Mark, Luke and John) into one definitive account of the life of Jesus which would clear up any inconsistencies between the four gospels. 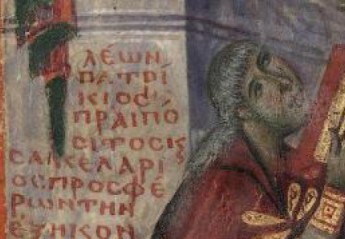 In The Fifth Gospel, Nogara attempts to use his discovery of the contents of the original Diatessaron to prove the authenticity of the Shroud. This brings us back to the elusive John. Without giving away the plot and ending of “The Fifth Gospel” I would just say that in Caldwell’s book, it is John’s account of the burial of Jesus that the plot ultimately turns on. In reaching that point, the book introduces us to the rise of a group known as the Alogoi (ΑΛΟΓΟΙ). The Alogi (also called “Alogians”) were a group of Christians in Asia Minor that flourished around 170 CE. The Alogi are dated to the same timeframe as the composition of the Diatessaron. They refused to accept neither the Gospel of John nor the book of Revelation. They attributed the two New Testament books to Cerinthus, who as noted above was actually an enemy to John. Most modern day Christians believe that John authored both of these books. Most scholars on the other hand have their doubts. At the very least, it is doubtful that the same author wrote both the Gospel of John and the book of Revelation because of wide differences in eschatology, language, and tone. The first time I read these two books in Greek it was like reading from completely different authors. The book of Revelation contains grammatical errors and abrupt abnormalities whereas the Gospel and the three Epistles tend to be stylistically consistent. This might indicate that the author of Revelation may not have been as familiar with the Greek language as the author of the Gospel of John and the letters attributed to John. When Revelation and the Gospel refer to Jesus as “lamb” they use different Greek words, they spell “Jerusalem” differently, the books seem to come from two different worlds . There are differing motifs between Revelation and the Gospel and the book of Revelation does not go into several typically Johannine themes, such as light, darkness, truth, love, etc. On the other hand the terms “Word of God” and “Lamb of God” for Jesus Christ are used similarly, indicating possible common theological backgrounds. Unfortunately we know very little about Cerinthus who the Alogoi attribute to be the true author of both the Gospel of John and Revelation. And we don’t even know very much about the Alogoi. Even more unfortunate is that most of what is known about Cerinthus comes to us from his opponents. In a future blog post, I will address what we know about Cerinthus and provide my opinion on his relationship to the writings that have been attributed to John.